The Yin Yoga Teacher Training I am taking has been one weekend a month since February. This month we are going to meet two times. This will be our final month. When we were first introduced to Jing Well Points the introduction was made with the points on both the hands and feet. We went on to learn about the sinew meridians associated with the legs and how they began at the jing well points on the feet. I posted about the Jing Well Points of the Feet first. Then I posted about the Leg Meridians in two separate post as there are Yin Leg Meridians and Yang Leg Meridians. First off, to make sure we are all on the same page, some believe there is Qi or energy moving through the body. The Qi moves through the body via channels or meridians. These meridians have starting points called Jing Well Points. There are many meridians in the body but our teacher training is focusing on the Sinew Meridians. They are less exact and the most superficial. They are the easiest to target by Yin Yoga. My posts about all of this so far has just been a way for me to somewhat sort out all the information I am getting. And to share it with you. These post are brief in the information as there is SO much. 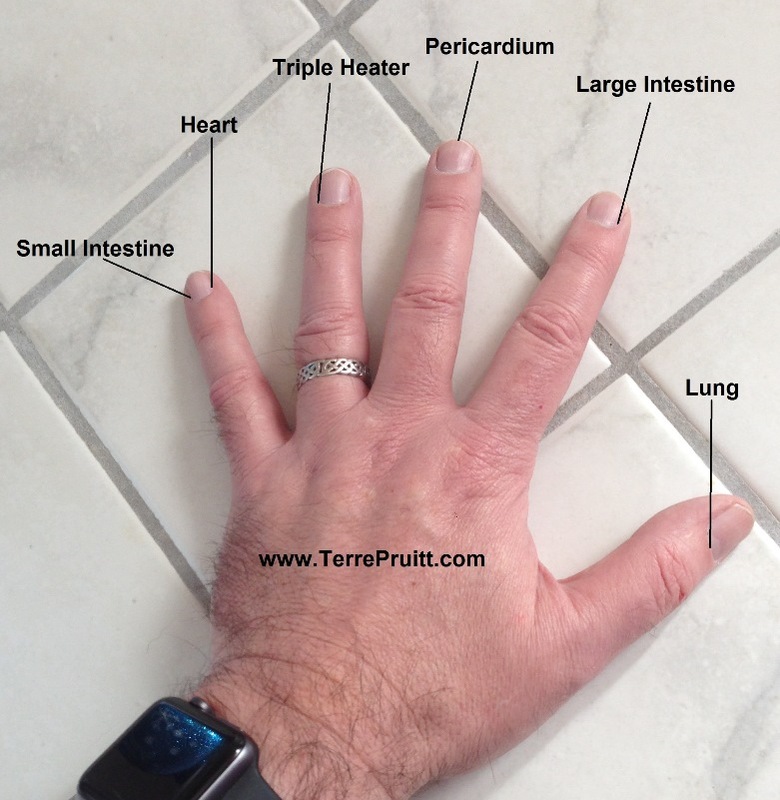 This post is about the jing well points in the hand. I have to give thanks to my husband who was my hand model. In the training we receive handouts of information, but when posting on my blog I like to post original creations. I don’t like to use other peoples stuff, I have, but I don’t like to so it is rare. So this is my creation, thanks to my hand model. There are six jing well points on the hand . . . just like the feet. And just like the feet, they are bilateral. So the left AND right thumb have the lung jing well point and so on. The jing well point for the small intestine is at the nail bed on the lateral side of the pinky. At the base of the nail bed of the pinky on the medial side is the heart jing well point. The lateral side of the ring finger at the nail bed is the jing well point of the Triple Heater. The tip of the middle finger is where the jing will point of the pericardium is. The medial side of the index finger at the nail bed is where the jing well point of the large intestine is. And the lungs’s jing well point is at the nail bed of the thumb. Also, just like the leg sinew meridians there are Yin Arm Sinews and Yang Arm Sinews. The jing well points can be activated by touch and pressure or movement. So as in my comment on my post about jing well points in the feet, the jing well points in the hands can be affected by acupressure or reflexology. Most Yin Yoga poses focus on the leg meridians, there are ways to incorporate the arm meridians into the poses. There are a few arm poses, but most of them incorporate the legs meridians too. Next we will learn the path of the arm meridians. Exciting, yes?